What an adorable Baby Animal Diaper Cake! Adorable giraffe, adorable colors, adorable embellishments, adorable ribbon, simply adorable! Kelly from Pennsylvania submitted her adorable diaper cake and has added her ideas to our ever growing collection of inspiring diaper cakes! We love our readers! Thanks so much Kelly! We love it! Do you have a diaper cake to share? 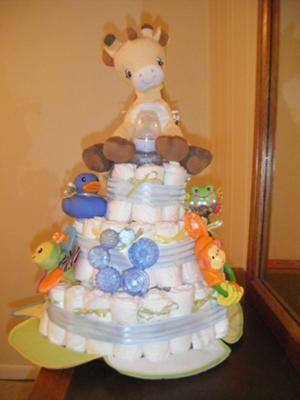 Click here to submit your own diaper cake!